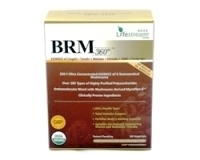 BRM360°™ stands for ‘Biological Response Modifiers’ which fortifies the body's immune response, to regulate and improve overall health. It is a cutting-edge mushroom-derived adjunct therapy made from highly concentrated and purified extracts of 6 well-researched nutraceutical mushrooms that has undergone 250 times concentration to make it the most concentrated mushroom essence available. Revolutionary orthomolecular (right molecules in the right amount) blending technology is used to produce BRM360°™, thereby offering extensive breadth and depth of the complex polysaccharides compounds for maximum therapeutic effects. A comprehensive array of chemical profile assurance tests are used to ensure purity and consistency in each and every batch. BRM360°™ contains more than 60% Total Polysaccharides (beta-Glucans) that supports a wide range of immune defenses like Natural Killer cells, T-cells and macrophage activities. This makes BRM360°™ an effective adjunct therapy to conventional cancer treatment, as it helps to greatly reduce side effects of chemo or radiation therapy as well as builds up the resistance of healthy cells against the damaging effects of such treatments.